Colorful and fragrant, this vegetarian and vegan carrot and ginger soup is a light and soothing soup. 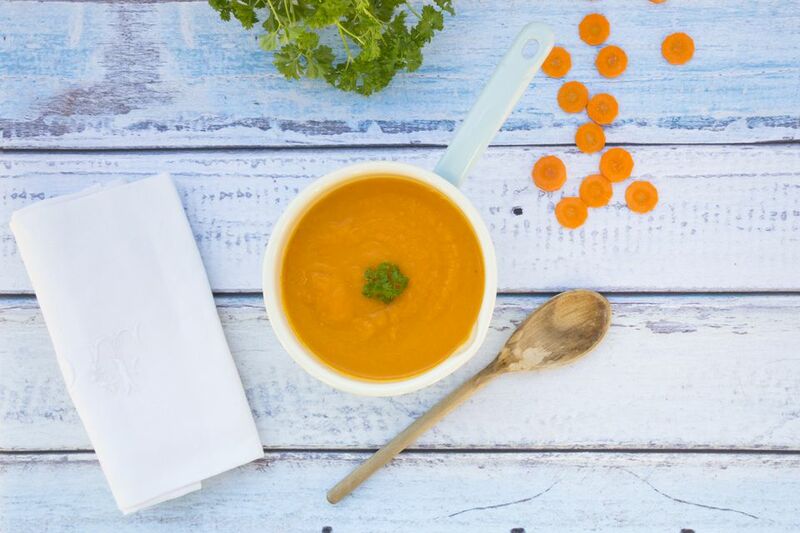 Carrot soup with ginger is a nutritious and low fat soup recipe with just a touch of sweetness and a touch of spice and definitely worth the effort! This recipe is just about foolproof. I've had so many people try it out and just rave about how amazing it is. The combination of the spices and the sweetness is really just incredible, and, with just a touch of oil for cooking the onions, it's quite low in fat and incredibly healthy. Want to reduce the fat to make this recipe nearly fat-free? Omit the cooking oil by heating the onion, ginger and carrots in a non-stick pan in just a touch of cooking spray. With all the other delicious ingredients, you won't miss out too much flavor at all, but you can always add in a half a bouillon cube if you'd like a little extra boost. This carrot and ginger soup recipe is both vegetarian and vegan, and, as long as you use homemade vegetable broth, it can be made gluten-free as well. Scroll down for more vegetarian carrot soup recipes. First, in a large pot, sautee the onions and ginger in the olive oil until soft, about 3-5 minutes. Next, add in the carrots and vegetable broth and reduce the heat to medium. Allow the carrots to simmer for about 40 minutes, or until they are soft. Working in small batches and using either a food processor, immersion blender or a regular blender, carefully process the soup until smooth. Return the pureed mixture to the pot to gently reheat. Or, if not needed, transfer your soup to a serving bowl and add a touch of nutmeg, salt and pepper, stirring well. Serve your vegan carrot and ginger soup with a dollop of soy or coconut non-dairy yogurt or vegan sour cream if desired, a sprinkle of nutmeg for garnish, and enjoy!